After a married couple, John and Laura Baxter, suffer through the tragic death of their young daughter, they move to Venice where John takes a job renovating an old church, but their stable existence is threatened when Laura meets a blind psychic woman and her sister, who warns her about impending doom. 'Don't Look Now' illustrates the fact that we can not outrun our fate, no matter how hard we try, we are only ever seconds away from meeting our demise. The film portrays this in the most beautiful and haunting way imaginable. Screenwriters Allan Scott and Chris Bryant, along with Director Nicholas Roeg bring Daphne Du Maurier's classic novel to life and create a brooding and atmospheric masterpiece. The opening scene of the film, is one of the most tragic and devastating you may ever encounter, from that point on you are aware you are watching a truly special cinematic experience. 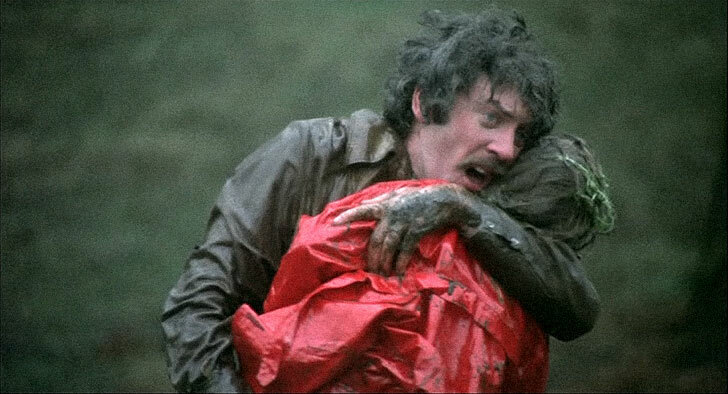 Weather you consider 'Don't Look Now' a Horror,drama or thriller, there is no denying that it will shake you to your core as it provides a visceral and terrifying ghost tale. But really, its more than that, It also portrays a parents worst nightmare in loosing a child and thanks to impeccable performances, this is portrayed to perfection. 'Don't Look Now' uses many effective motifs and red herrings throughout the film but they are never intelligence insulting and always grow organically as the story progresses. I have heard this film be called slow, I think that's an idiotic statement, because if your truly invested in the film, its atmosphere,tension and sense of impending doom will keep you exhilarated until its haunting and unforgettable climax. The two central performances of the film are absolutely brilliant. Julie Christie and one of my favorite actors, Donald Sutherland both give landmark showing as grieving parents. The performances are so real, so emotional and so heartbreaking. 'Dont Look Now' is a fantastic British film that succeeds in all genres in dabbles into. Its a terrifying and devastating yet beautiful experience that you may never forget.